When you think of Vans Warped Tour, bands such as Bad Religion or NOFX probably come to mind – not a band that specializes in playing the washboard, five-gallon bucket or bottleneck slide. Meet Reverend Peyton’s Big Damn Band, a little bit of an anomaly in itself. The Southern Indiana-based trio produce soulful, country blues with topics ranging from the disappearance of the American family farm to crystal meth abuse; but the weighty material doesn’t mean they don’t know how to get down. The danceable, sing-a-longs often celebrate rural life and anchor their reputation as an incredible live band. In the studio, they are as raw as it gets. They don’t use overdubs, and record strictly on analog tape. You can’t get more country than that. The guitarist/vocalist Reverend Peyton, vocalist/washboard extraordinaire Breezy Peyton and drummer/bucket aficionado Aaron Persinger hit the Slowdown stage Saturday (Kyle Eustice). 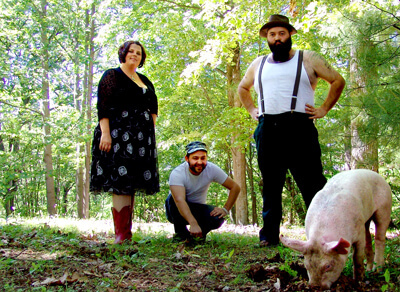 Reverend Peyton’s Big Damn Band, September 10, at Slowdown, 729 N. 14th St., 8 p.m. Tickets are $10. Visit www.theslowdown.com for more information.